“I had such a lovely evening. Loved the vitality, focus and commitment of your gorgeous students that was evident in every movement and gesture”. Seven years ago it started as a showcase for Nikki Northover’s dance students to go through their paces for families and friends. But now Nikki’s annual show has become a must-see stylish extravaganza, harvesting the creative skills of innovative local composers and choreographers as well as an army of accomplished young hoofers. In Tapistory, Nikki has re-focused on her first love, tap. The show opens on five sets of tap shoes arranged on the stage, and we watch as members of Tapistory (Bridport Youth Tap Dance Ensemble) put them on. 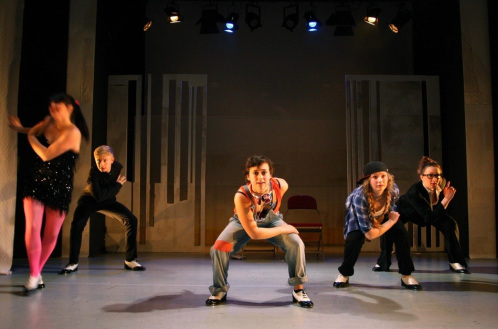 Nikki’s choreography, and the androgynous black-and-white costumes with waistcoats and bow ties, celebrate the street/city/showbiz history of tap. But then it evolves, as tap weaves into other dance styles, moods and stories throughout the evening. In Nikki’s ‘Colours’, a dappled treescape projected onto the backdrop creates a magical space for fusions of tap and barefoot lyrical movement. In ‘You Don’t Have To’, created by Niki McCretton with and for Marina Renee-Cemmick, Marina’s powerful taps melt into subtle patters that flow into almost weightless floor work. We still have the rousing percussion of ensemble pieces with up to sixteen glittery performers tapping on stage in perfect synchrony, but at other times humming, breaths, chanting, and other surprises explore the space within the rhythms. Often it is an everyday movement celebrated and transmuted into the stuff of dance, as when Niki McCretton, mistress of the unexpected, choreographed ‘Cloisters’ a rhapsody on the theme of playing with your hair and considering how you compare with your friend, immaculately performed by Kiarnah Rait-McDonald and Connie Treves. Or the hilarious ‘Time Stop’ which defies dance clichés, counterpoising jiggling, waddling and scratching with sensuous movement to take us to the edge of comedic drama, exquisitely performed with a playfulness that is the hallmark of true confidence. That the dancers benefit hugely from the opportunity to perform and choreograph is reflected in the number who later win a college place to study dance, or a job in performance. Each year we see students moving from the back to the front row and then finding their feet in duets and solos, and there is always more talent waiting to come forward. Harry Poole has grown from a promising boy dancer to the debonair soloist of this year’s ‘I Got Rhythm’. The sparky young members of the new Bridport Boys Dance Group, under the tutelage of Anna Golding, look set to challenge ‘boys don’t dance’ stereotypes and follow a similar path. Interesting new contributors to choreography were Jonny Hoskins and ex-student Rebecca Whaley; and in addition to Andrew Dickson’s musical composition, always a highlight, there was an exciting piece by Rob Lee, while live music/song were provided by Andrew Dickson, Matt Benjamin, Bridget Pearse, Rob Lee, Ben Stephens and Ella Squirrel. Production values were higher than ever: costumes blending variations on a theme; scenery understated; lighting changes accurate and carefully-judged. There were too many impressive dancers to list, but in addition to those mentioned, striking performances were given by Emily Meech, Annie Pownall, Emma Jane Dennis, Elias Halkes-Wellstead, Lizi Shaw and Naomi Takezoe. Tap on, Bridport Youth Dance!